The single family homes of Arroyo Vista range in size from 1765 to 3300 square feet. 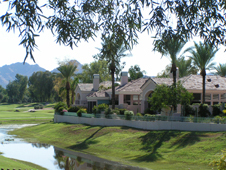 There are 61 homes in this subdivision, many of which enjoy golf course views of the 5th, 6th, and 7th holes on the Arroyo Golf Course. HOA fees run $428 per month. Prices begin around $675,000. If you’re not in the mood to cook one evening, just walk across the street to Wally’s for a great casual meal!